The opening party will take place on 29 June 2019 at Hlemmur Square. The preview night will take place on 30 June at Tjarnarbíó, where all acts get only a minute to present their work. Shows will take place in various venues across the city from 1-6 July. The program for the festival will be up in spring 2019. 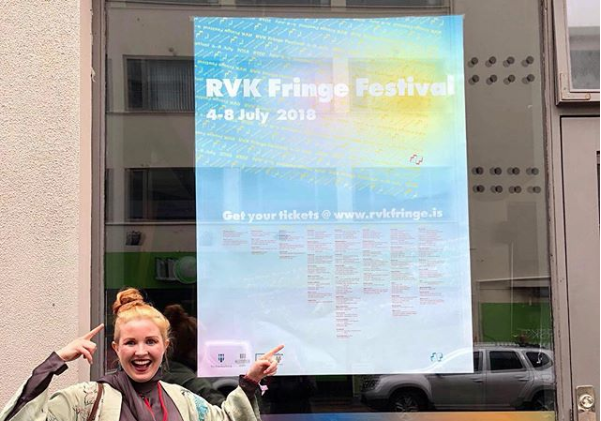 The program for RVK fringe 2018 spanned 5 days stretching to 8, showcasing more than 50 artists/groups with more than 130 performances. Here is the full program for 2018. Gallery exhibition Orð by Sólveig Eva and Monstress by Helga Thoroddsen. Vættir. Starts outside Iðnó, storytelling on your phone. Icelandic 537-0990. English 537-0991. All day, everyday. 18:30-19:30 Ladies, gentlemen and all in-between! 20:50-21:50 Ladies, gentlemen and all in-between!